A chemical reaction causes one rotten apple to spoil them all. The purpose of this experiment is to measure fruit ripening caused by the plant hormone ethylene, by using an iodine indicator to detect the conversion of plant starch to sugar. A Hypothesis: The ripening of an unripe fruit will be unaffected by storing it with a banana. 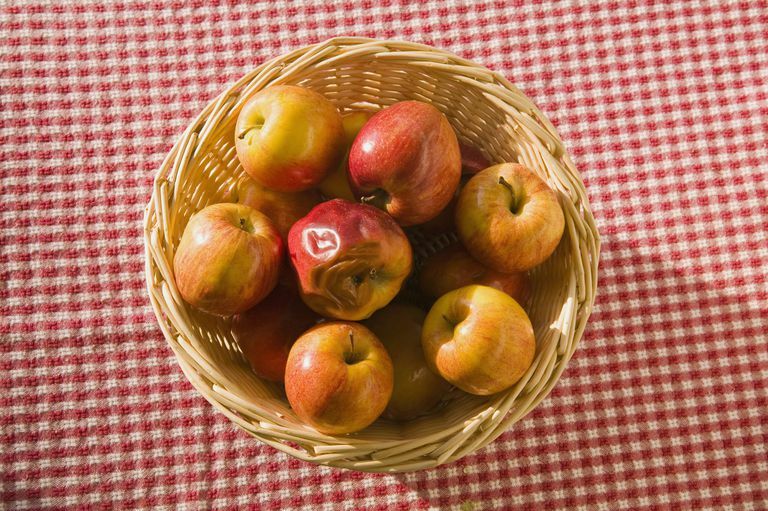 You've heard that "one bad apple spoils the whole bushel." It's true. Bruised, damaged, or overripe fruit gives off a hormone that accelerates the ripening of the other fruit. Plant tissues communicate by means of hormones. Hormones are chemicals that are produced in one location that have an effect on cells in a different location. Most plant hormones are transported through the plant vascular system, but some, like ethylene, are released into the gaseous phase, or air. Ethylene is produced and released by rapidly-growing plant tissues. It is released by the growing tips of roots, flowers, damaged tissue, and ripening fruit. The hormone has multiple effects on plants. One is fruit ripening. When fruit ripens, the starch in the fleshy part of the fruit is converted to sugar. The sweeter fruit is more attractive to animals, so they will eat it and disperse the seeds. Ethylene initiates the reaction in which the starch is converted into sugar. Iodine solution binds to starch, but not to sugar, forming a dark-colored complex. You can estimate how ripe a fruit is by whether or not it is darkened after painting it with an iodine solution. Unripe fruit is starchy, so it will be dark. The riper the fruit is, the more starch will have been converted to sugar. Less iodine complex will be formed, so the stained fruit will be lighter. It does not take many materials to perform this experiment. The iodine stain may be ordered from a chemical supply company, such as Carolina Biological, or if you are doing this experiment at home, your local school may be able to set you up with some stain. Do not use metal utensils or containers for preparing or storing the iodine solutions. Iodine is corrosive to metals. The iodine solutions will stain skin and clothing. Read the safety information for chemicals used in the lab and follow safety precautions. After the experiment is completed, the stain may be washed down the drain. If you are not sure your pears or apples are unripe, test one using the staining procedure outlined below before continuing. Label the bags, numbers 1-8. Bags 1-4 will be the control group. Bags 5-8 will be the test group. Place one unripe pear or apple in each of the control bags. Seal each bag. Place one unripe pear or apple and one banana in each of the test bags. Seal each bag. Place the bags together. Record your observations of the initial appearance of the fruit. Observe and record the changes to the appearance of the fruit each day. After 2-3 days, test the pears or apples for starch by staining them with the iodine stain. Store the iodine stain solution in a brown or blue glass or plastic bottle. It should last for several days. Pour the iodine stain into the bottom of the shallow tray, so that it fills the tray about half a centimeter deep. Cut the pear or apple in half (cross section) and set the fruit into the tray, with the cut surface in the stain. Allow the fruit to absorb the stain for one minute. Remove the fruit and rinse the face with water (under a faucet is fine). Record the data for the fruit, then repeat the procedure for the other apples/pears. Add more stain to the tray, as needed. You can use a (non-metal) funnel to pour unused stain back into its container if you wish, since it will remain 'good' for this experiment for several days. Examine the stained fruit. You may wish to take photographs or draw pictures. The best way to compare the data is to set up some sort of scoring. Compare the levels of staining for unripe versus ripe fruit. The unripe fruit should be heavily stained, while fully ripe or rotting fruit should be unstained. How many levels of staining can you distinguish between the ripe and unripe fruit? You may wish to make a scoring chart, showing staining levels for unripe, ripe, and several intermediate levels. At a minimum, score your fruit as unripe (0), somewhat ripe (1), and fully ripe (2). This way, you are assigning a quantitative value to the data so that you can average the value for ripeness of the control and test groups and can present the results in a bar graph. If the ripening of the fruit was unaffected by storing it with a banana, then both the control and test groups should be the same level of ripeness. Were they? Was the hypothesis accepted or rejected? What is the significance of this result? The dark spots on bananas release a lot of ethylene. Fruit produces ethylene in response to bruising or wounding, too. Will the pears or apples in the experiment ripen more quickly if the ethylene concentration is higher, from using bruised bananas rather than undamaged bananas? If you have more bananas, you will have more ethylene. Does using more bananas cause the fruit to ripen faster? Temperature affects the ripening of fruit, too. Not all fruits are affected the same way. Apples and pears ripen more slowly when refrigerated. Bananas blacken when they are refrigerated. You could place a second set of Controls and Test Bags in the refrigerator to explore the effect temperature on ripening. Fruit ripening is affected by whether or not the fruit remains attached to the parent plant. Ethylene is produced in response to removing the fruit from its parent. You can design an experiment to determine whether fruit ripens more quickly on or off the plant. Consider using a smaller fruit, such as tomatoes, which you can find on/off the vine in supermarkets. What are some of the triggers for ethylene production by plants? How does the presence of ethylene affect fruit ripening? What are the chemical and physical changes that occur as fruit ripens? How can an iodine stain be used to distinguish between ripe and unripe fruit?